Built 1884-1887 by Manuel Pereira. Decoration by Eugénio do Nascimento Cotrim and Luigi Manini. 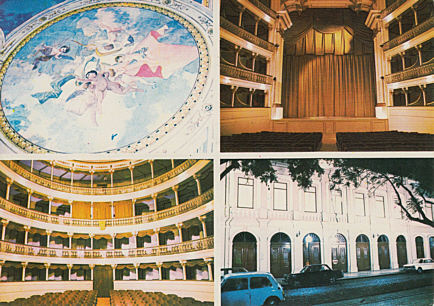 Opened 11 Mar 1888 as "Teatro D. Maria Pia", named in honour of King Don Luis's wife, Dona Maria Pia (1847-1911). Later renamed in honour of the 16th century Madeirean poet, Baltazar Dias. Used for theatre performances and as a cinema. 394 seats. 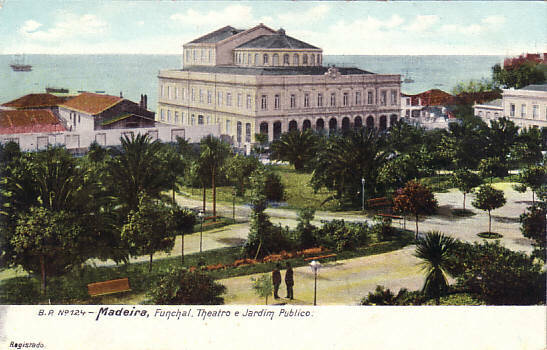 Front Text: "Madeira, Funchal. Theatro e Jardim Publico"
Reverse Text: "Teatro Munciipal Baltazar Dias, 1899, Funchal - Madeira"